1 Copyright © 2010 Ruby L. Taylor. All Rights Reserved. 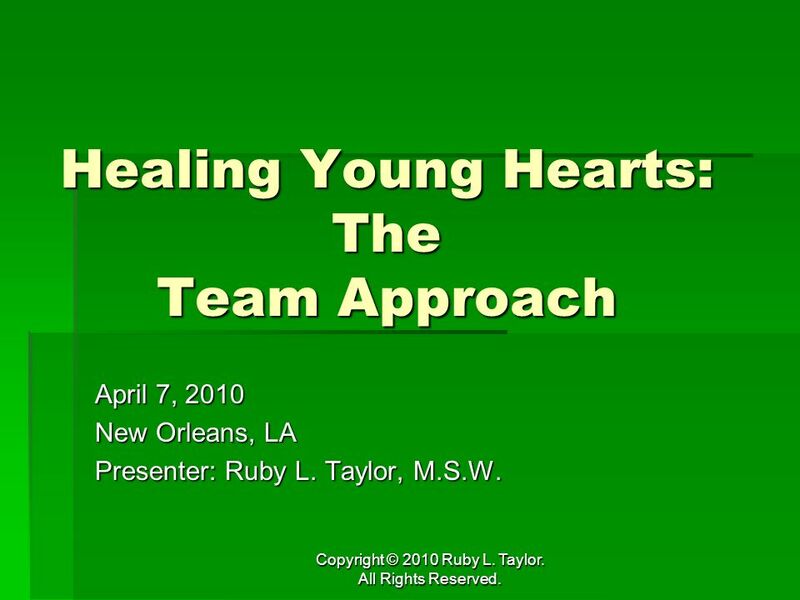 Healing Young Hearts: The Team Approach April 7, 2010 New Orleans, LA Presenter: Ruby L. Taylor, M.S.W. 2 Copyright © 2010 Ruby L. Taylor. All Rights Reserved. INTRODUCTION Who am I? (Ruby Taylor) Who am I? (Ruby Taylor) If I Can Help Somebody If I can help somebody, as I pass along, If I can cheer somebody, with a word or song, If I can show somebody, how they're traveling wrong, Then my living shall not be in vain. Chorus: My living shall not be in vain, Then my living shall not be in vain If I can help somebody, as I pass along, Then my living shall not be in vain. If I Can Help Somebody If I can help somebody, as I pass along, If I can cheer somebody, with a word or song, If I can show somebody, how they're traveling wrong, Then my living shall not be in vain. Chorus: My living shall not be in vain, Then my living shall not be in vain If I can help somebody, as I pass along, Then my living shall not be in vain. Written in 1945 by Alma Bazel Androzzo, made famous by Mahalia Jackson Who are you? Why did you come to this workshop? Who are you? Why did you come to this workshop? 4 Copyright © 2010 Ruby L. Taylor. All Rights Reserved. KEYWORDS Grief–A personal reaction to loss. Grief–A personal reaction to loss. Resiliency–The ability to bounce back and move on after dramatic change. Resiliency–The ability to bounce back and move on after dramatic change. 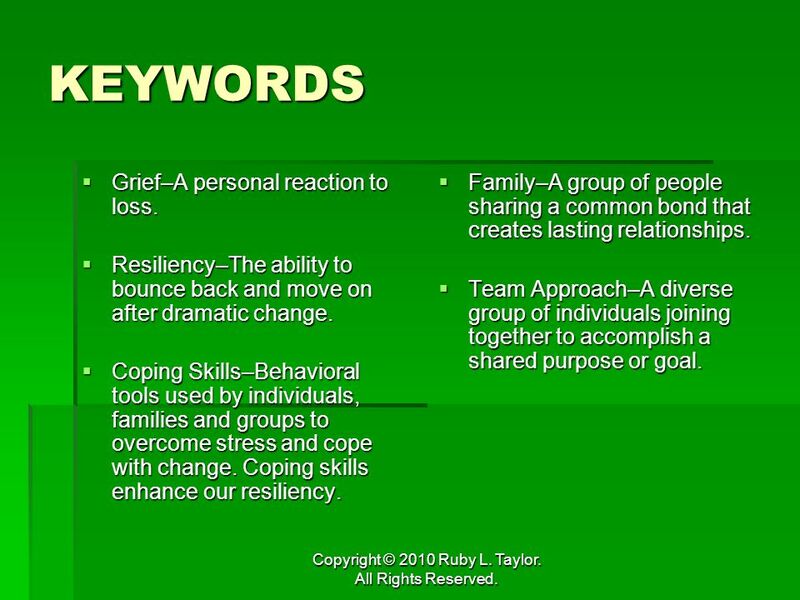 Coping Skills–Behavioral tools used by individuals, families and groups to overcome stress and cope with change. Coping skills enhance our resiliency. Coping Skills–Behavioral tools used by individuals, families and groups to overcome stress and cope with change. Coping skills enhance our resiliency. Family–A group of people sharing a common bond that creates lasting relationships. Family–A group of people sharing a common bond that creates lasting relationships. Team Approach–A diverse group of individuals joining together to accomplish a shared purpose or goal. Team Approach–A diverse group of individuals joining together to accomplish a shared purpose or goal. 6 Copyright © 2010 Ruby L. Taylor. All Rights Reserved. How Children Grieve Although individual children grieve differently, almost all children exhibit certain reactions to loss. 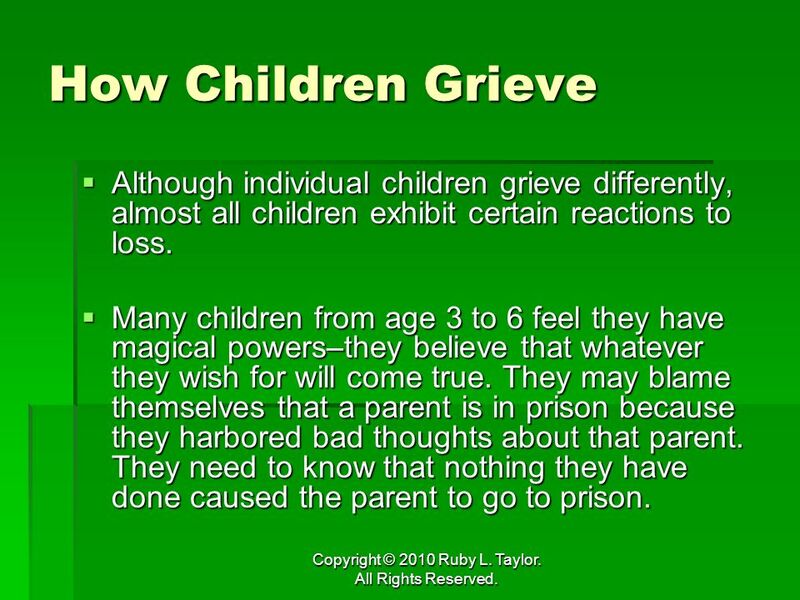 Although individual children grieve differently, almost all children exhibit certain reactions to loss. Many children from age 3 to 6 feel they have magical powers–they believe that whatever they wish for will come true. They may blame themselves that a parent is in prison because they harbored bad thoughts about that parent. They need to know that nothing they have done caused the parent to go to prison. Many children from age 3 to 6 feel they have magical powers–they believe that whatever they wish for will come true. They may blame themselves that a parent is in prison because they harbored bad thoughts about that parent. They need to know that nothing they have done caused the parent to go to prison. 7 Copyright © 2010 Ruby L. Taylor. All Rights Reserved. 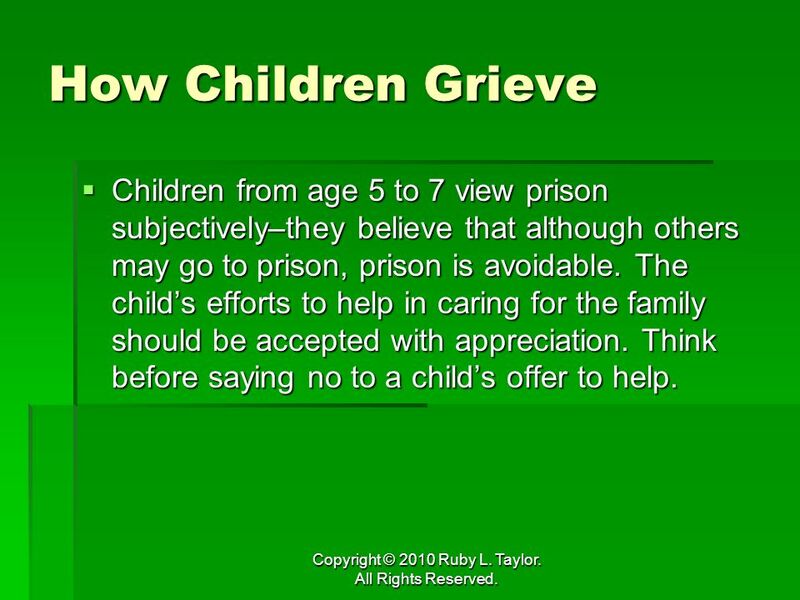 How Children Grieve Children from age 5 to 7 view prison subjectively–they believe that although others may go to prison, prison is avoidable. The childs efforts to help in caring for the family should be accepted with appreciation. Think before saying no to a childs offer to help. Children from age 5 to 7 view prison subjectively–they believe that although others may go to prison, prison is avoidable. The childs efforts to help in caring for the family should be accepted with appreciation. Think before saying no to a childs offer to help. 8 Copyright © 2010 Ruby L. Taylor. All Rights Reserved. 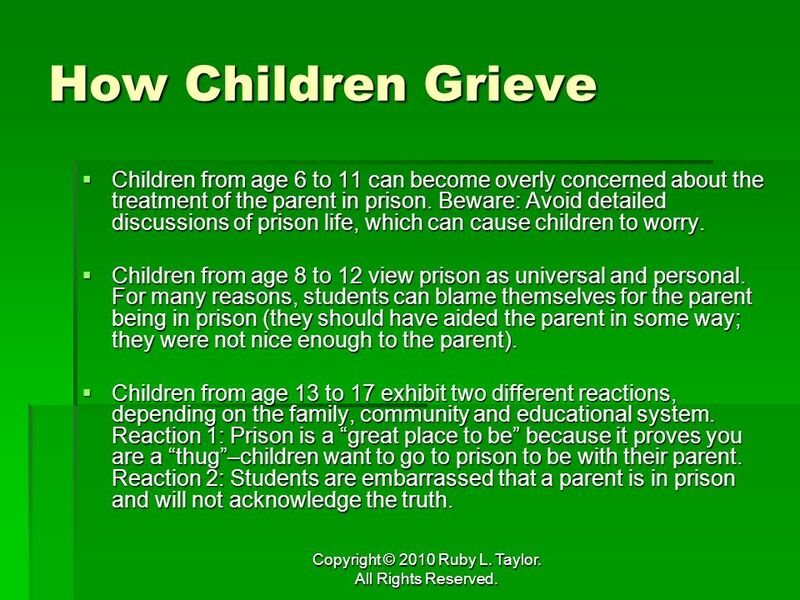 How Children Grieve Children from age 6 to 11 can become overly concerned about the treatment of the parent in prison. Beware: Avoid detailed discussions of prison life, which can cause children to worry. Children from age 6 to 11 can become overly concerned about the treatment of the parent in prison. Beware: Avoid detailed discussions of prison life, which can cause children to worry. Children from age 8 to 12 view prison as universal and personal. For many reasons, students can blame themselves for the parent being in prison (they should have aided the parent in some way; they were not nice enough to the parent). Children from age 8 to 12 view prison as universal and personal. For many reasons, students can blame themselves for the parent being in prison (they should have aided the parent in some way; they were not nice enough to the parent). Children from age 13 to 17 exhibit two different reactions, depending on the family, community and educational system. Reaction 1: Prison is a great place to be because it proves you are a thug–children want to go to prison to be with their parent. Reaction 2: Students are embarrassed that a parent is in prison and will not acknowledge the truth. Children from age 13 to 17 exhibit two different reactions, depending on the family, community and educational system. Reaction 1: Prison is a great place to be because it proves you are a thug–children want to go to prison to be with their parent. Reaction 2: Students are embarrassed that a parent is in prison and will not acknowledge the truth. 10 Copyright © 2010 Ruby L. Taylor. All Rights Reserved. What Are the Needs? 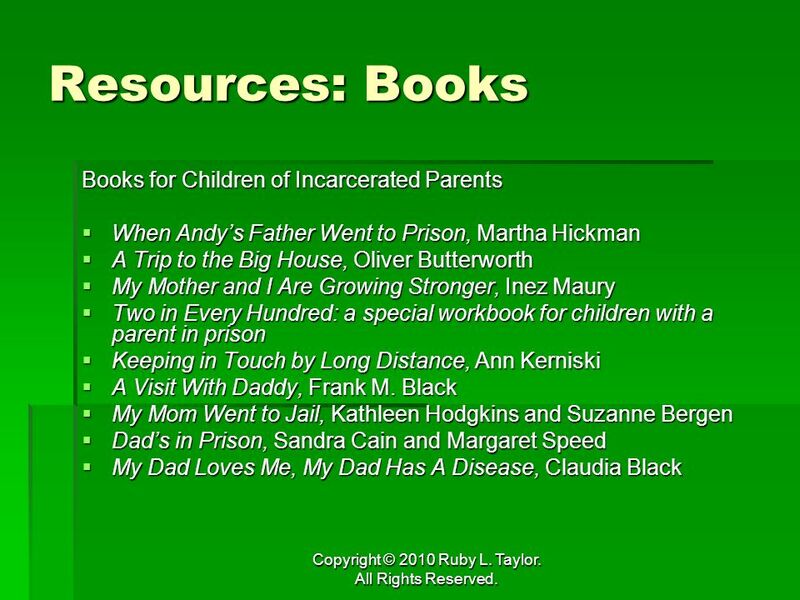 What are the needs of grieving students and families of incarcerated parents? 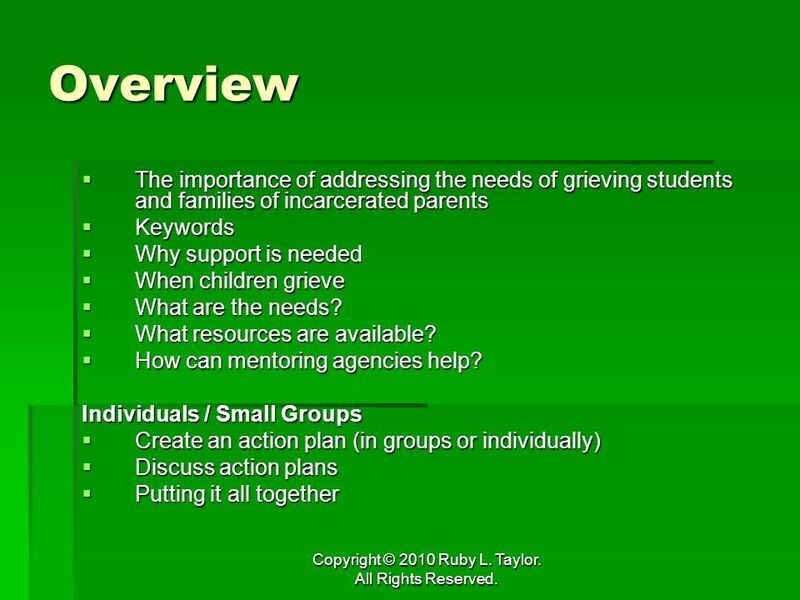 What are the needs of grieving students and families of incarcerated parents? 11 Copyright © 2010 Ruby L. Taylor. All Rights Reserved. 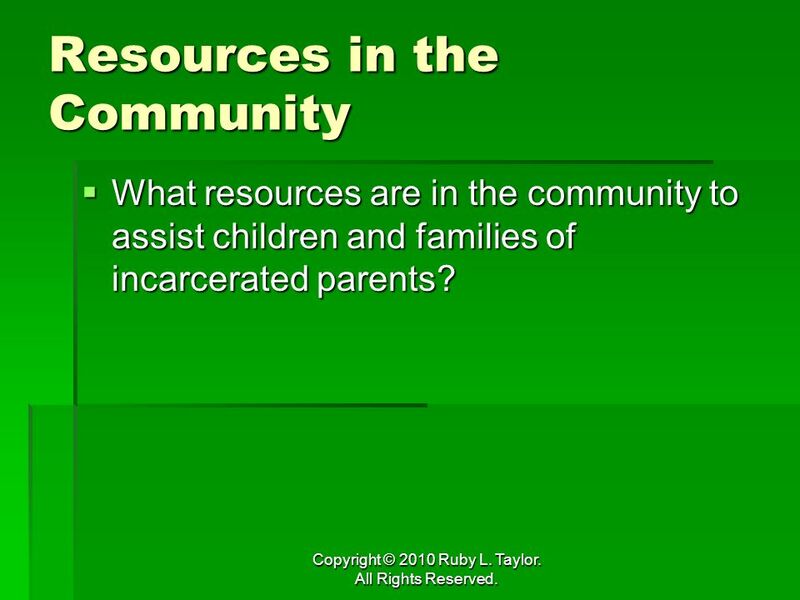 Resources in the Community What resources are in the community to assist children and families of incarcerated parents? 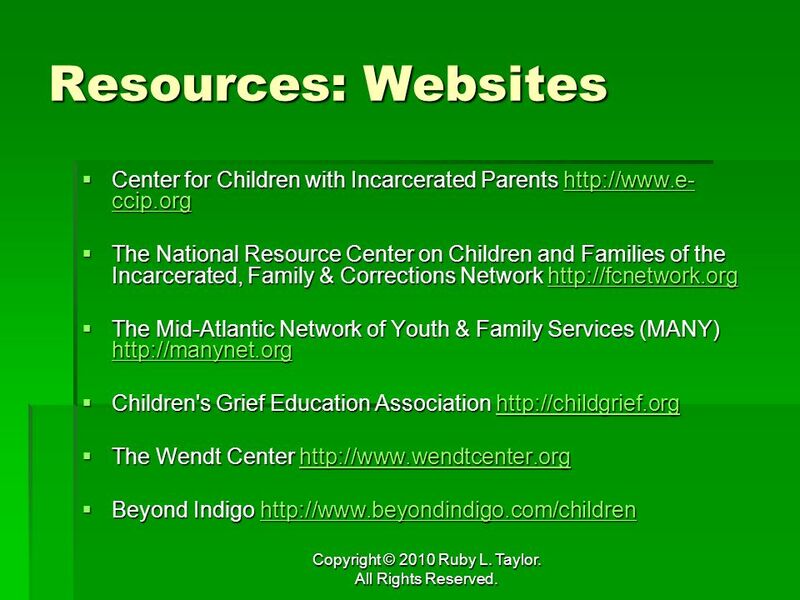 What resources are in the community to assist children and families of incarcerated parents? 13 Copyright © 2010 Ruby L. Taylor. All Rights Reserved. What Can You Make Possible? 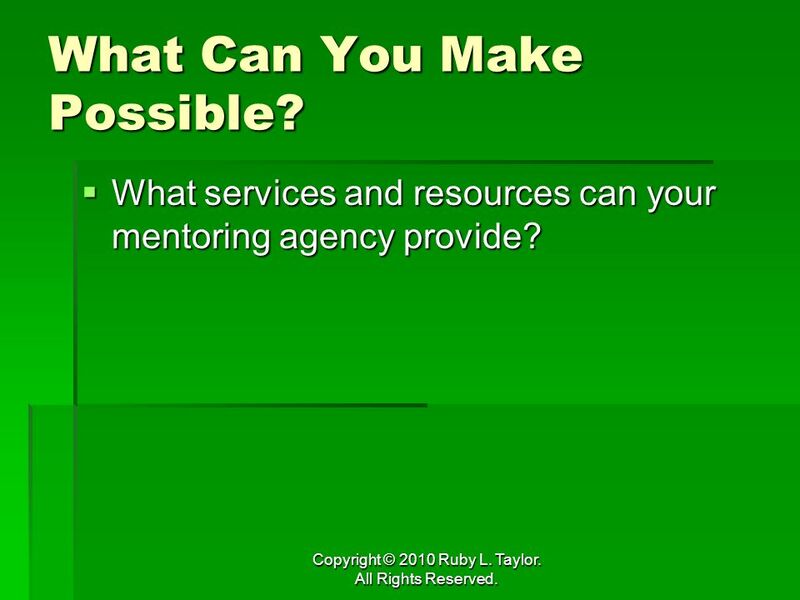 What services and resources can your mentoring agency provide? 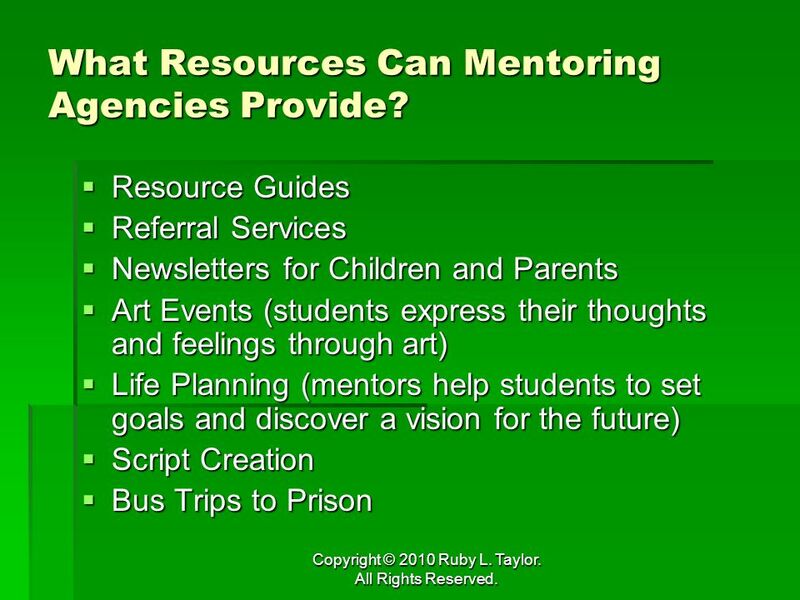 What services and resources can your mentoring agency provide? 15 Copyright © 2010 Ruby L. Taylor. All Rights Reserved. 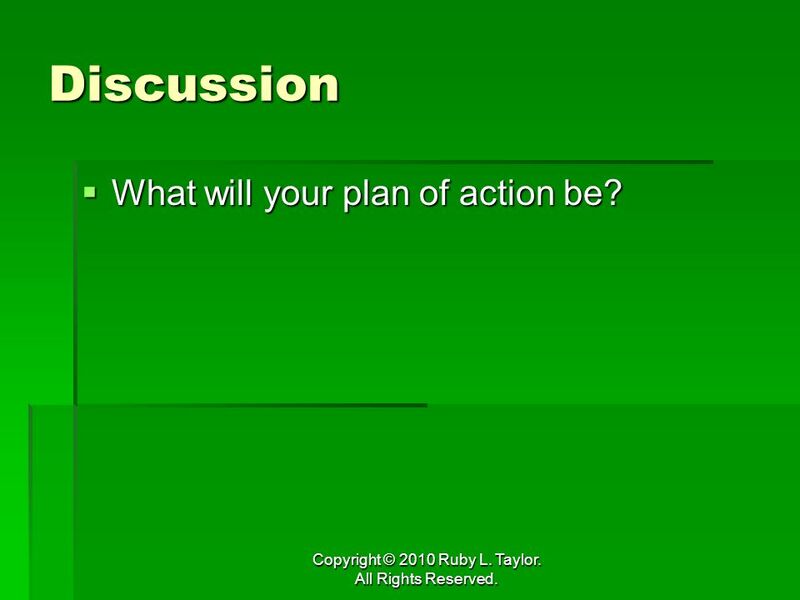 Discussion What will your plan of action be? 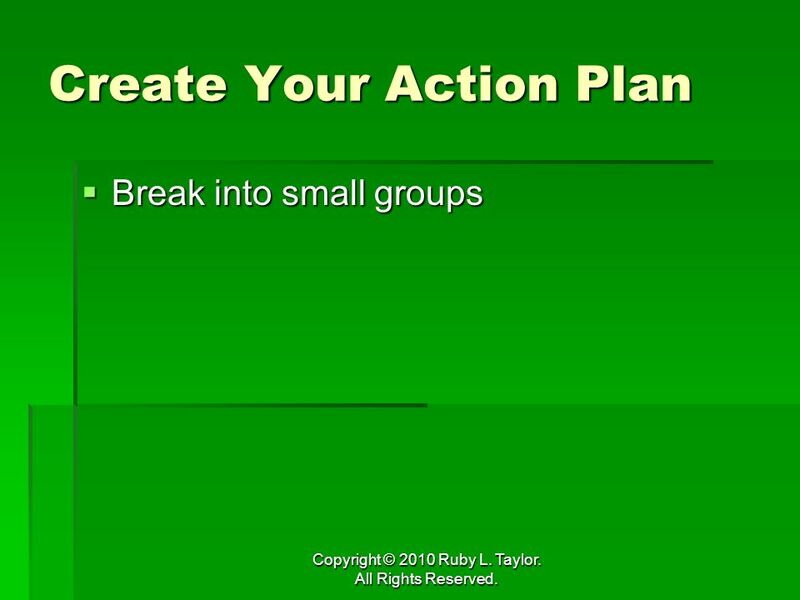 What will your plan of action be? 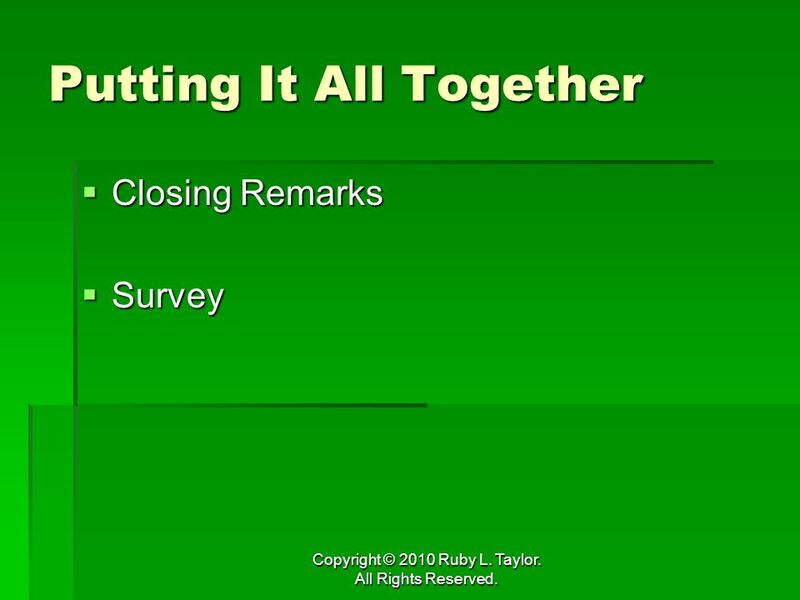 Download ppt "Copyright © 2010 Ruby L. Taylor. All Rights Reserved. 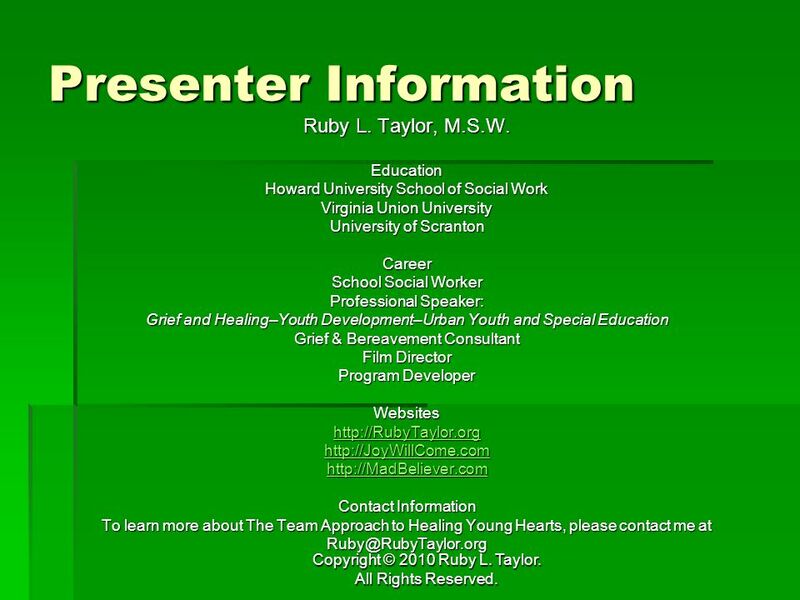 Healing Young Hearts: The Team Approach April 7, 2010 New Orleans, LA Presenter: Ruby L. Taylor,"
1 SIBLINGS Geoff Bowen Psychologist, Statewide Vision Resource Centre. Grief and Loss Issues in Elementary-Age Children Chippewa Valley Schools Information for Teachers. A Program of Good Grief. The Seasons for Growth Program is a loss and grief education program catering for young people aged 6-24 years. The Program focuses. Death and Dying The effects on parents with the sudden loss of a child. New York Association of School Psychologists & New York State Office of Mental Health Present Depression in Young Children: A Workshop for Adults Who Care. Parents R 4-Ever Session 2 Impact of Divorce on Children. A Center for Grieving Children & Teens Kathleen Cramer Managing Director, Ele’s Place Peggy Galimberti, LMSW, ACSW Program Director, Ele’s Place. Forestdale Inc. Fathering Initiative Father/Male Accountability “Looking For More Than Just A Few Good Men” Presented by: Howard L. Wheeler. Death and Grieving How Children Cope Death is not easy to deal with for anyone. It is always difficult to accept, and requires a grieving process. People. Caregiver Workshop Coping with the Unique Challenges of Adults with Brain Disease University of California, San Francisco Mission Bay Campus. By: Glenda K. Lane & Phillip N. Lambert Jr.
Children’s reactions following a disaster. A disaster, either concerning the family or the wider community, may cause fear, uncertainty and disruption. CAMHS Introduction to MALT CAMHS Services In Nottingham Sally Falkner & Rebecca Tivey September 2011.